There is saying that, when there is more frequent change in login passwords, the more secure accounts will be, so it is responsibility of every BSNL employee to change their BSNL ERP login password frequently towards security. No separate portal is available for employees to change BSNL ERP login password or to unlock the services on the login page. So, if you want to access your BSNL Pay Scale details, personal information and medical claims, just enter into the SAP netweaver login portal and change or reset the ESS BSNL employee login password with the following simple process. With in one or two minutes, your new BSNL ERP password will sent to your registered email. Open your email account and check the mail in Updates or Inbox folders. Paste your BSNL ERP default password in old password option. Enter your new login password and Confirm password as same with combination of alphabet, numeric and special characters. 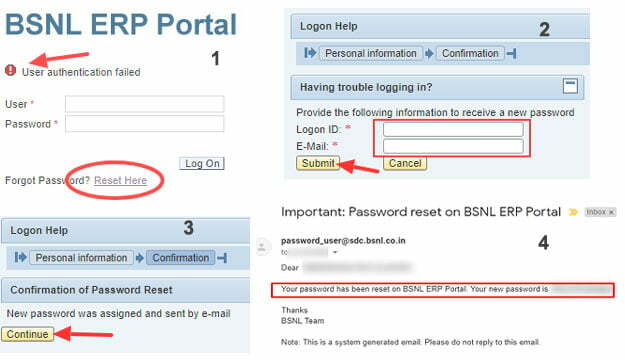 Due to multiple attempts in three variations, BSNL ERP SAP netweaver portal login page locked, and at that time, there is no option to employee for BSNL ERP password recovery or to reset the authentication failed password in locked SAP portal. In this situation, BSNL employee must approach concerned ERP nodal officer of SSA for BSNL ERP password reset from locked status. After resetting the same from authorities, employee allows to change BSNL ERP default password again with new. In the above two cases, you will immediately allowed to login to BSNL ERP Portal with new login credentials by changing the default password. 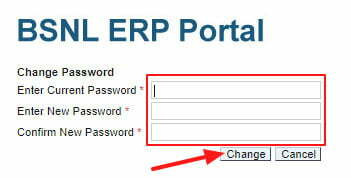 To keep SAP ESS portal member login services more secure, any employee may change the BSNL ERP login password once every 30days and the same login password does not repeat for the last three changes. For every thirty days, BSNL ERP portal password change option will appear on your screen when you want to access ESS SAP netweaver login page and if any display error occurs, please configure your browser with BSNL ERP page settings to overcome the login page error. BSNL ERP login portal eportal.erp.bsnl.co.in/irj/portal is now accessible even on your Android and iOS mobile version, and if you are facing any problem to access the defined pages of BSNL ERP portal on your desktop browser, then check your browser settings carefully to overcome the ERP login page issue simply. In earlier, only the Internet explorer is supported for BSNL ERP Portal login, runs on SAP technology. When on browsing, the maximum users will use Google Chrome, Firefox, Microsoft Edge and some on Opera and IE, so, now the admins of BSNL ERP portal have configured the settings to work the same ESS portal login on other browsers also other than IE. 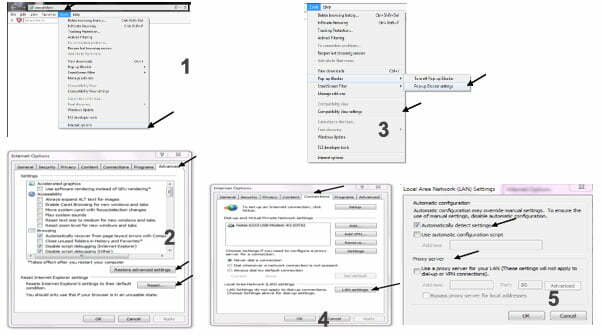 Even if you are comfortable to use with Internet explorer, then check the following settings for smooth functioning of BSNL ERP login on your browser runs with any operating system. Check the Tools > Pop up blocker and Compatibility View settings and add *.bsnl.co.in for both if not available. Click Tools > Internet Options > Connections > LAN Settings and check Automatically detect settings in ON or not and if any Proxy server is enabled, please disable the settings to access BSNL ERP ESS portal. Even if the error occurs after login into BSNL ERP and not display the available options, then you are suggested to opt for another browser like Microsoft Edge and Google Chrome. If you found any ERP login page errors or ERP display page error, please uncheck the proxy settings if any adjusted. In maximum cases, a desktop or laptop configures with old operating system and with Microsoft XP will raise the BSNL login page errors, but the latest versions like Windows 8, 8.1, and 10 does not give any errors by supporting the new browsers. The best recommended browsers to access BSNL ERP portal is Google Chrome and Microsoft Edge, so login to BSNL ERP on your mobile or desktop with your chrome browser and access your ESS portal services at any time.